The Internet of Things (IoT) is but one of the phrases bandied about to characterize the advanced connectivity of devices, systems and services that goes beyond machine-to-machine (M2M) communications. It covers a variety of protocols, domains and applications. In addition to IoT, there’s the Industrial Internet, the Internet of Everything and variations on each as the concept continues its creep into the branding realm. For this month’s series of articles, we’ll stick with IoT. IoT enables freight and passenger roads to use sensors, software M2M learning, “Big Data” analytics, cloud computing and other technology to gather and analyze information from various sources and data streams — and then use those analyses to drive efficiencies, better manage operations and, possibly, offer new services. 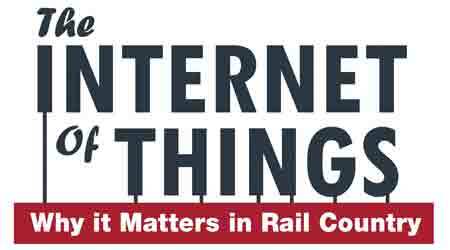 IoT, then, represents a world of opportunity for railroads and the technology providers that serve them. And it’s a world strategists in all railroad departments — from information technology (IT) to transportation to engineering to mechanical to communication and signaling — will need to tap into and be engaged with as the digital evolution continues. In rail country, the data seeds were sown with automatic equipment identification (AEI) tags, the first of which were installed in North America in 1989. A train crew received a message from a wayside detector, and AEI readers updated a database with passing and directional information. They were passive tags; the power was supplied by the reader. When the Internet entered the mainstream in the mid-1990s and the general public was well on its way to untangling the Web, North American railroads weren’t exactly early adopters. But some of their customers were. At Procter & Gamble, brand manager Kevin Ashton put radio-frequency identification (RFID) tags on packages as they moved through the supply chain, and then linked them with the Internet. “Early on, it was just RFID,” says Keith Dierkx, IBM’s global industry leader-rail and director of the company’s Global Rail Innovation Center. In 1999, Ashton coined the “IoT” term, using it in the title of a presentation he made at P&G, or so conventional wisdom/IoT lore goes. Ashton as a technology board member of the Massachusetts Institute of Technology’s Auto-ID Center — continued to ponder the possibilities connectivity/IoT afforded within the supply chain. GE Transportation now characterizes itself as a global digital industrial supplier. For good reason: The company's Evolution™ Series Tier 4 locomotive features more than 200 onboard sensors that monitor performance and health and process more than 1 billion instructions per second. And as the rail industry became “more instrumented, interconnected and intelligent,” business model innovation became more attainable, Dierkx wrote. “For rail executives to capitalize on such change, they need to accelerate investment in new intelligence,” he noted. Railroads have been investing in that new intelligence, particularly in recent years. For example, Union Pacific Railroad has been connecting wayside hotbox detectors systemwide, creating a single network to determine trend lines and identify bearings before they fail. UP also is developing a proprietary ultrasonic wheel crack detection system to prevent derailments, which in turn drives safety and efficiency. 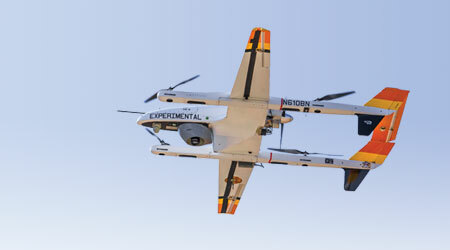 Last year, the Federal Aviation Administration granted BNSF Railway Co. permission to use unmanned aerial vehicles (UAV) to obtain video after a derailment or to perform bridge inspections in unsafe conditions. “We’re leveraging video coming back from those UAVs and hope to predict failures before they happen,” BNSF Vice President and Chief Information Officer Jo-ann Olsovsky told attendees of GE’s 2015 Minds + Machines summit, held Sept. 29-Oct. 1, 2015, in San Francisco. But all the major freight roads, really, have been investing in remote and real-time monitoring technology to measure rail-car and locomotive health, track condition and component condition; increasingly, short lines and regionals are, too (see page 18). Ditto for passenger railroads and transit agencies. “The big challenge is the integration of all this,” as CN VP and CIO Serge Leduc told Progressive Railroading in 2013. Technology providers are more than happy to help on the integration front. 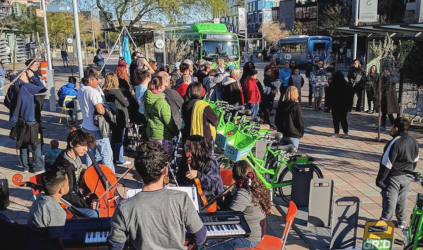 They’re well aware of the transformation railroads are going through — they’re going through it, as well. The aim is to help customers drive productivity, too. Introduced in 2012 and field tested in 2013, GE’s Evolution™ Series Tier 4 road locomotive features more than 200 onboard sensors that monitor performance and health, process more than 1 billion instructions per second and provide about 10 gigabytes of data per year. So far, GE has delivered more than 500 Tier 4-compliant locomotives to North American customers. “The value capture [from these units] so far has been incredible,” says GE’s Miller, who was named president and CEO last September after serving as GE’s SVP and CIO. Miller cites the company’s Trip Optimizer software as an example of that value capture. Installed on 7,000 locomotives in North America, the software builds an optimal operating plan based on data collected about a train’s characteristics. In 2015, it saved customers $200 million in fuel costs, says Miller. Other GE applications, from Movement Planner (crew management) to Yard Planner (hump yard optimization) to OASIS (operational control for intermodal yards), also continue to “unlock value,” says GE Transportation Chief Digital Officer Seth Bodnar. Linking it all is GE’s Predix Cloud™, a platform-as-a-service. Predix captures and analyzes the volume, velocity and variety of machine data within a secure cloud environment. The platform soon will be commercially available to customers and other industrial businesses for managing data and applications. Technology providers also are lining up to serve passenger railroads. In 2014, Cisco Systems unveiled Connected Rail, a solution designed to modernize aging rail networks, improve safety, drive down expenses and provide passengers an “improved connected experience.” The technology, which integrates onboard, trackside, wayside, signaling and back-office systems, includes a positive train control component. The Cisco® IoT System comprises a range of products designed to address network connectivity, physical and cybersecurity, data analytics, management and automation, cloud-based application development and Cisco Fog Computing. “When you’re talking about massive amounts of data like we are here, there’s only so much you can house onboard a locomotive,” GE’s Miller says. And we’re talking massive amounts of data. Some of the new-generation track geometry cars with digital video are generating nearly a petabyte of data a year, says Allan Zarembski, research professor and director of the Railroad Engineering and Safety Program in the University of Delaware’s Department of Civil and Environmental Engineering. Attendees ranged from railroaders in the engineering, IT, operations and transportation departments; railroad contractors; and suppliers. Representatives from five Class Is and Amtrak also spoke, sharing their respective roads’ “needs” from Big Data. Zarembski and two of his colleagues presented a case study titled “Using Big Data Techniques to Determine the Relationship Between Rail Defects and Track Geometry Defects.” It featured the results of a Federal Railroad Administration-sponsored project that made use of five years of inspection data from 21,000 miles of track on a major freight railroad and used Big Data analysis techniques. More than 335,000 track geometry defect records and 26,000 rail defect records were analyzed. Even more valuable information can be gleaned via IoT. 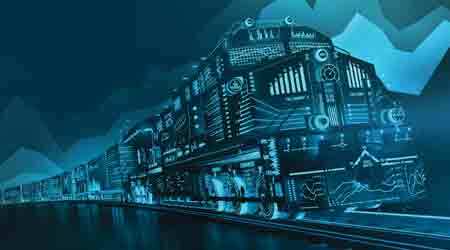 In theory, strategists could be able to use Big Data analytics and cognitive computing to predict market shifts like the crude-by-rail traffic boom from a few years back and other energy trends, IBM’s Dierkx suggests. For now, rail execs appear to have their data drawers full integrating the tools they already have. “If nothing else, we want to be proactive rather than reactive, so we can look ahead and identify where our problems are going to be and plan accordingly,” says Zarembski, adding that the University of Delaware’s Department of Civil and Environmental Engineering plans to host its third annual Big Data conference sometime in December.